If your question's not here – don't hesitate to contact me – I can help. how will new paint make a difference? what is "color stories" paint? Color Stories paint is a full-spectrum paint line developed and manufactured by Benjamin Moore Paint – from their website: "Unlike conventional formulas, the unique Color Stories palette does not use black or gray tints. Instead, more pigments—anywhere between five and seven—are incorporated per color (traditional methods generally utilize three pigments). These colors have greater clarity and purity, and are richer and more vibrant." Color Stories paint colors are sold exclusively in what Benjamin Moore calls "über-performance"
From Benjamin Moore's website: "Because Color Stories hues are achieved with many pigments, each prescription is very complex and requires paint with a formulation that can easily support the increased pigments. Aura applies easily with excellent flow and leveling for a smoother, premium finished look. And it dries fast, allowing you to apply a second coat on the same day to save you time and money." Aura paint is a paint and primer in one, and comes in four finishes: Matte, Eggshell, Satin and Semi-Gloss. Also available in a High-Gloss finish is Aura Grand Entrance (in quart size only in California) – perfect when painting fireplace mantles, bookshelves, furniture – anywhere where you want a little more drama or light bounce; Color Stories is not recommended for exterior use. what wallpapers do you specify? If you're curious to know more about wallpaper, Apartment Therapy has a wonderful, ﻿mini-history of wallpaper﻿. what does a colorific consultation provide? 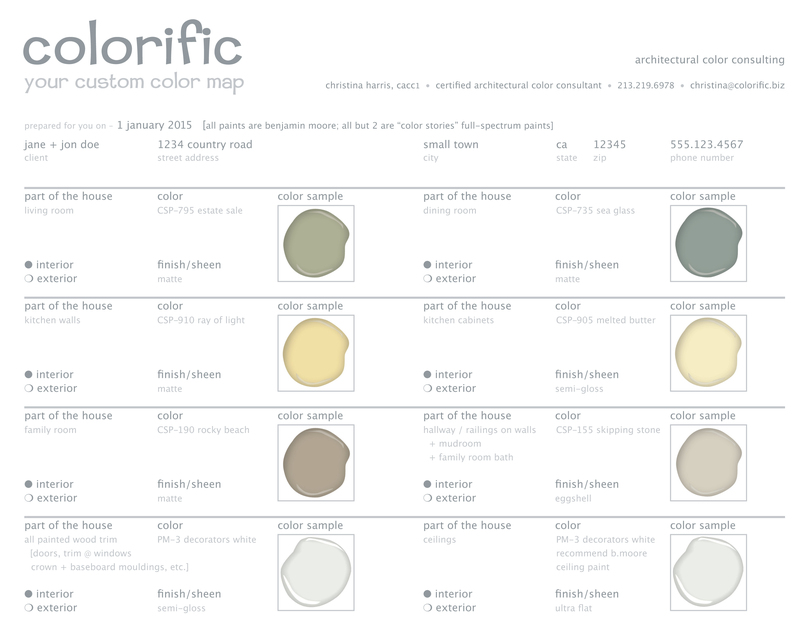 what is a color consultation like? will my stuff go with the new paint colors? can "color stories" paints be "matched"? Medium answer: It's impossible to match Color Stories paint colors because most paints are only 2 to 3 tints, but Color Stories paint colors are created with 5 to 7 tints not available in other paints. Long answer: The only assurance of getting an authentic Benjamin Moore Color Stories color is by using Benjamin Moore paint, since the exclusive colorants and resins are proprietary and formulated with the company's own patented waterborne base technologies. VOC stands for "Volatile Organic Compound" – shorthand for the chemicals in paint (and other household products) that turn into a vapor and "off-gas" into the air. Aura paint is under 50 grams per liter which meets California's strict air-quality standards. Here's some info from the EPA on products in your home that off-gas VOCs: "VOCs are emitted by a wide array of products numbering in the thousands. Examples include: paints and lacquers, paint strippers, cleaning supplies, pesticides, building materials and furnishings, office equipment such as copiers and printers, correction fluids and carbonless copy paper, graphics and craft materials including glues and adhesives, permanent markers, and photographic solutions." Information about low-VOC paints from Consumer Reports online: "Allowable levels of VOCs... for paints and products such as aerosol air fresheners, carpets, and furniture have been toughened because VOCs contribute to ozone and smog formation and are linked to respiratory illnesses and memory impairment. Federal VOC limits are now set at 250 grams per liter (g/l) for flat paints and 380 g/l for others. Some states and regions have lowered the VOC levels for paints that can be legally sold in their areas. California's standards are stringent: 150 g/l for nonflat finishes and 100 g/l for flat. Even tougher is the 50 g/l level for all finishes set by California's South Coast Air Quality Management District (AQMD), around Los Angeles." Aura paint is under 50 g/l.